Uncategorized – Page 2 – A small and customer orientated Caviar & Luxury food company based in London. This has to be the customer’s favourite caviar type. This Sturgeon can reach up to 160 years of age. This is a Hybrid of the Freshwater Beluga and the Amur Sturgeon. Matures much later and hence more expensive. We have many customers that believe thou that it’s worth that bit more to get a high grade quality product.2,4-2,8mm roe, a grey silver shimmer and a slightly harder shell that pops in your mouth with an amazingly creamy aftertaste. If you ever feel that you need to try a caviar for the first time, then Beluga is worth it. Give it a try, spoil yourself!! Luxury Truffle & Oil hamper. I know nothing better then standing in the kitchen with a nice glass of wine and a selection of mouthwatering ingredients to get the imagination running. So here is a selection of some of my favourite truffle products and oil. Many people would say that there is no substitute for fresh produce, the pungent aroma of earthy fungus can’t be beaten. I would partly agree. But who can have a box of truffles in the fridge at a whim. Here is where this little basket of goodies comes into it’s own. Not only do you have the products when you need them, but also in various stages of preparation: Minced, sliced, in butter/oil or with Porcini mushrooms. Lovely!! In march we are offering this lovely hamper for only £89.00 so there is no reason to wait. Watch out for our upcoming Caviar tasting event’s. This is your chance to sample some of the best caviar on the market at our upcoming caviar tasting events. Source: Watch out for our upcoming Caviar tasting event’s. A luxurious dish of chicken in a creamy mushroom sauce topped with truffle shavings. Add half the oil to a large hot pan. Season the chicken pieces with salt and pepper. Add to the pan and fry until deep-golden brown, then turn over and repeat on the other side. Heat a large casserole or heavy based pan until hot then add two tablespoons of oil. Fry the lardons until crisp, then add the shallots and garlic and cook until coloured. Transfer the chicken to the casserole. In the same frying pan, fry the mushrooms in the butter for 3-4 minutes. Add the Madeira, stock, cream and tarragon. Season to taste with salt and freshly ground black pepper. Pour the sauce over the chicken and simmer for 15-20 minutes. To serve, pile the chicken in a serving bowl, cover in sauce and shave over the truffle. TRUFFLE – distinctive fruit of the earth! The truffle is a fruit of the earth which has been known about since ancient times. Sometimes called “the diamond of the kitchen” it captivated Kings and Queens. We would like to captivate you with our Italian black summer truffle. With a rich, woodsy aroma and flavours of garlic, wild mushroom and earthy hazelnut undertones they are one of our most popular products during the summer. Highly prized for their gastronomic qualities, a niche delicacy is well suited to Italian cuisine; just a very small amount of truffle is sufficient to enrich dishes giving a strong fragrance and a delicate, distinctive and unmistakable taste. To order some of these earthy delights head to our website. 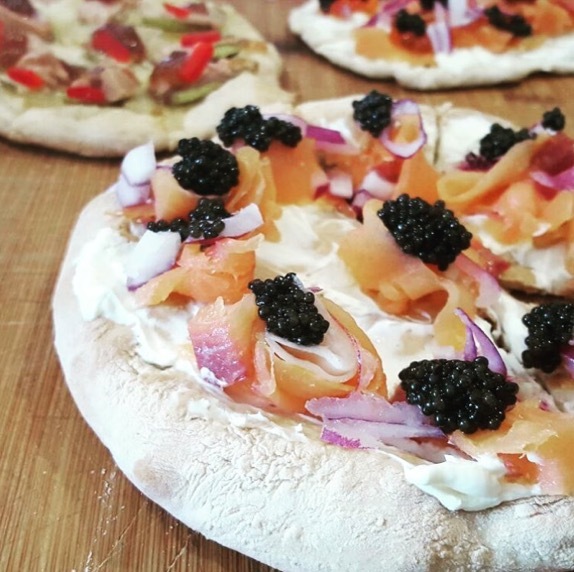 Caviar Classic London is constantly looking for new and unique ways to show off our fabulous products and we believe now is the right time to introduce to you our luxurious Caviar and Fine Foods Pizzas! Forget your typical cheese and tomato and pepperoni toppings and try one of our fabulous recipes! Although the craze for caviar was initially influenced by much of the Japanese cuisine, we believe this amazing food has the potential to be used creatively in many different ways, instead of serving the delicacy simply on a blini. We have come up with two must try pizza recipes, one savoury and one absolutely amazing sweet tasting pizza with Foie Gras and Fig Confit! On a floured surface, roll out 350g of bread dough to a thickness of 1/2 cm, stretching with your hands. Then place it on an oven tray lined with parchment paper at a preheated oven of 210 ° or Gas Mark 7. Peel the pears, cut them into very thin slices by removing the heart and seeds. Expand the mozzarella into thin slices. In a saucepan, warm the fig confit constantly stirring. Spread this mixture over the dough, cover with pears and mozzarella. Salt, pepper, bake for about 20 minutes, until the dough is golden. Meanwhile, cut the foie gras into small cubes. Place them on the pizza before serving, very hot. Use a knife, an icing spatula, or the back of a spoon to spread the dill cream or cream cheese (about 2 tablespoons) over the inner circle. Arrange the slices of salmon ( 2 1/2 ounces, thinly sliced) so that they cover the entire pizza , slightly overlapping the raised rim. Sprinkle some chopped onion over the salmon, as much or as little as you like. Finally add as much of your favourite caviar you like and serve immediately!